On Saturday 29 November the Saint James’s Singers and Players will perform Verdi’s Requiem in All Saints’ Church, Leamington Spa. 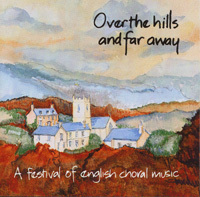 Joining the St James’s Singers for this concert will be the Banbury Choral Society and the City St James’s Singers creating a choir of 150 voices to perform this monumental work. 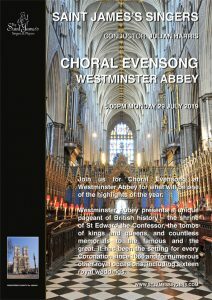 There is a stellar line up of soloists: Soprano – Cheryl Enever, Alto – Lorna Perry, Tenor – Ed Harrisson, and Bass – David Soar. All but one of Guiseppe Verdi’s masterworks are operas. This poses a problem for those who are not opera buffs. Fortunately, though, that one exception is his stunning Requiem, into which he poured the same vibrant emotion that thrills opera fans. Indeed, there have been critics who have referred to Verdi’s Requiem as his “finest opera”, but the serious listener must surely recognise the sincerity of the music, albeit extremely dramatic in parts. The amazing range of contrasts and textures makes an unforgettable impression upon all who sing and play the work, and upon all who hear a live performance. The concert is dedicated to the memory of Tim Britten, who was such a devoted and loyal Founder Friend of the Saint James’s Singers. 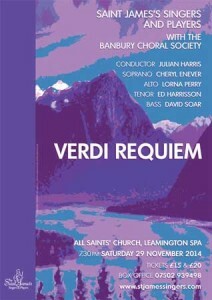 Tickets for the Verdi are priced at £20.00 and £15.00. I was bowled over by the Verdi Requiem performance last Saturday. I sang first bass in three performances of this work during November with the Saint Michael’s Singers, and felt the need after that to hear it as the member of an audience. Many congratulations to Julian Harris, the wonderful soloists, the superb orchestra and the choir for what to me was an unforgettable experience. Thanks for the comments. Glad you enjoyed it.